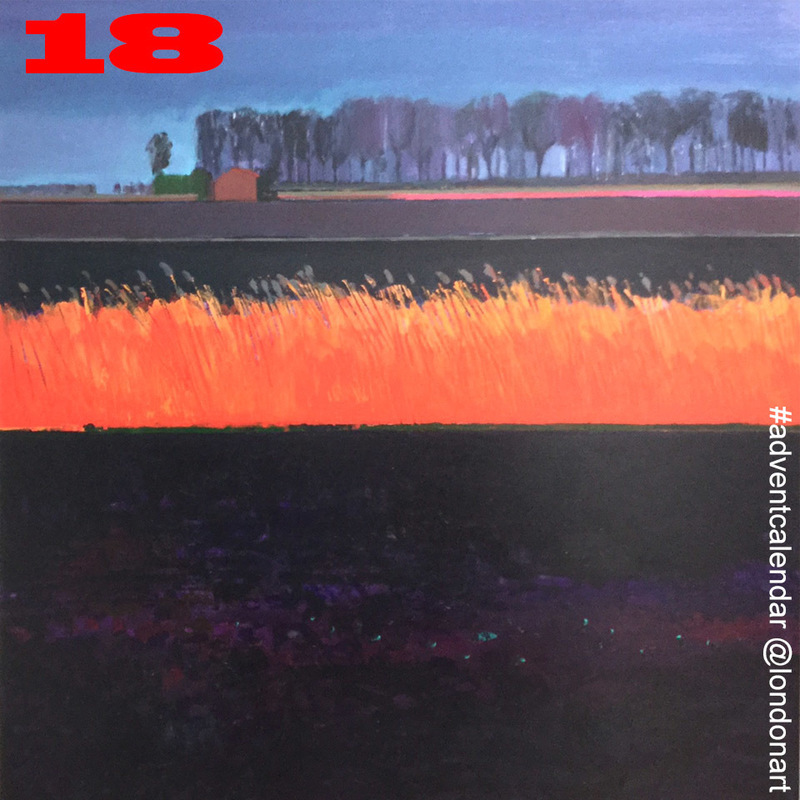 Day 13: 'Lay Down' by London artist Leah Capaldi is a site-specific installation at Matt's gallery's newish south of river space. The work consists of a video sculpture with continual performance, inspired by the artist's time in the deserts of the American West. 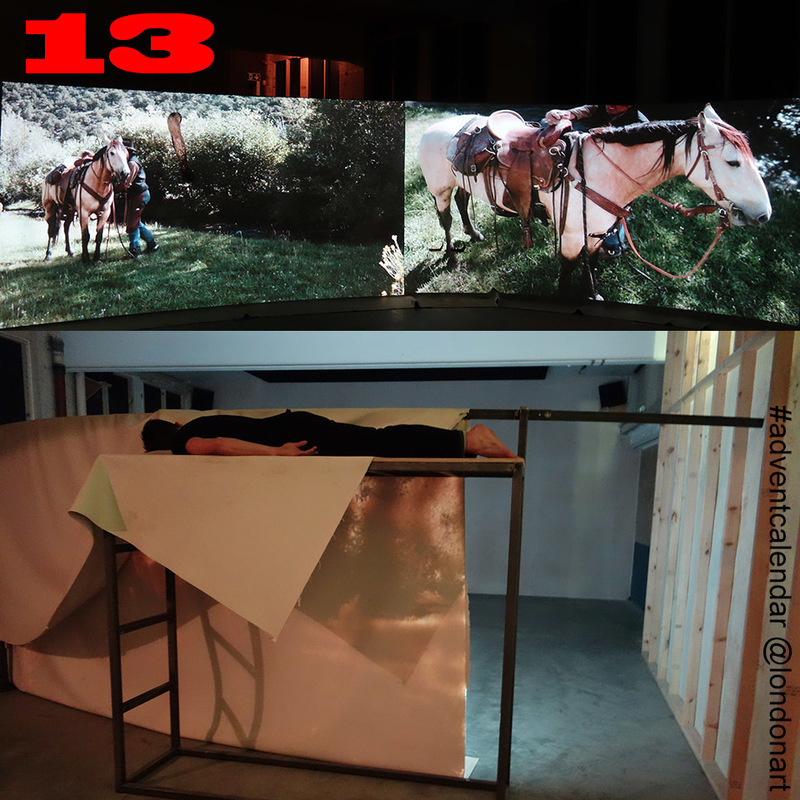 There, Capaldi met a Utah cowboy & his horse, a film exploring their relationship and the vast, performative landscape that surrounds them forms the core of the installation. 'Lay Down' asks how power is constructed & understood, this question arising throughout the installation, in the iconic figure of the American cowboy, the influence of the sublime landscape and the authority of the screen. The crossover area between the disciplines of sculpture & performance are of particular interest to Capaldi's practice, with echoes of the seminal performance work of the late 1960s & early 70s. 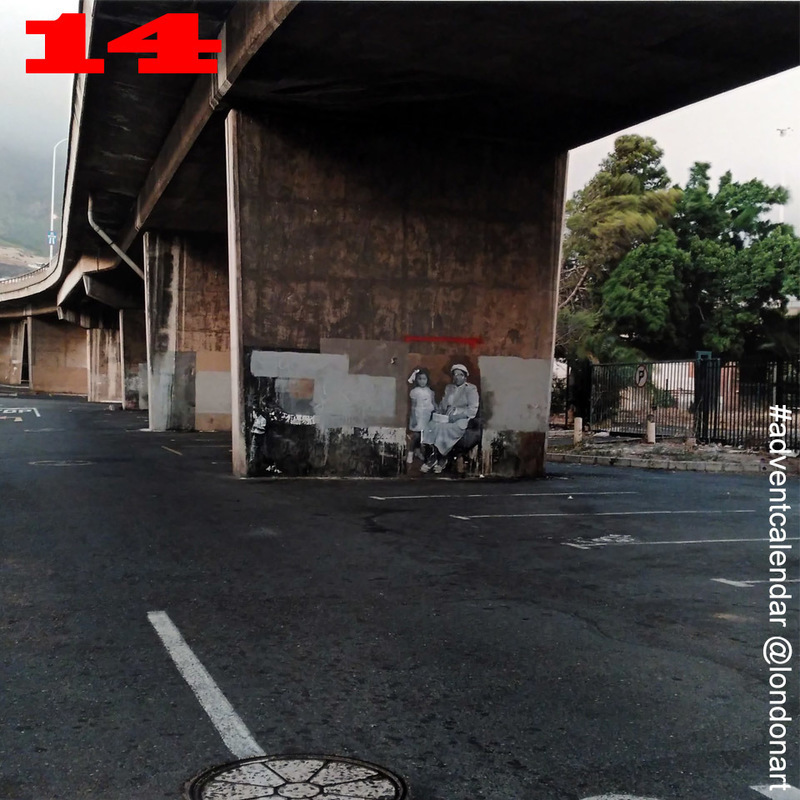 Day 14: "under the N2 flyover, Woodstock" by South African photographer David Lurie represented by Sulger-Buel Lovell. Lurie's work captures the graffiti in urban environment which reflects the social fabric and local culture of a place. 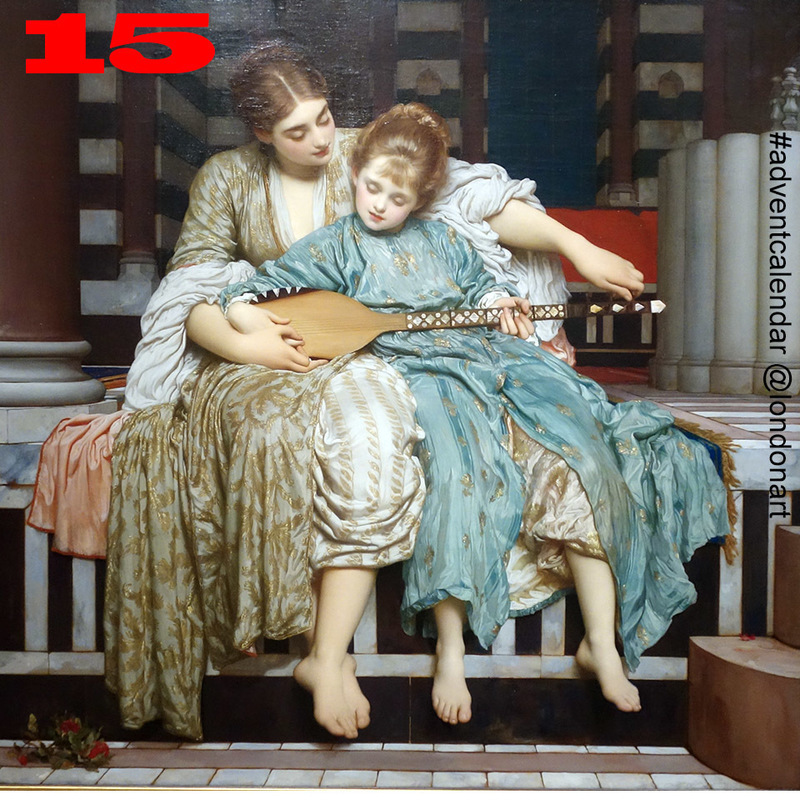 Day 15: the Music Lesson by Frederic Leighton in Guildhall Art Gallery's Victorians Decoded: Art & Telegraphy exhibition. The show explores the impact of telegraphy on the artistic imagination & wider social consciousness in the 19thC. Art works selected are chosen with the 4 themes around the ground-breaking technology of that era - distance, transmission, coding and resistance. In this piece, a mother teaches her daughter to play a Turkish saz. The rhythmic patterns in the pillars and inlaid marble of the interior give a visual equivalent of the spaced-out sequence of notes. The dangling legs of parent and child also suggest notes on a stave. The transmission of knowledge is achieved by steady pulsing, something like the telegraph key tapping to transmit a message. 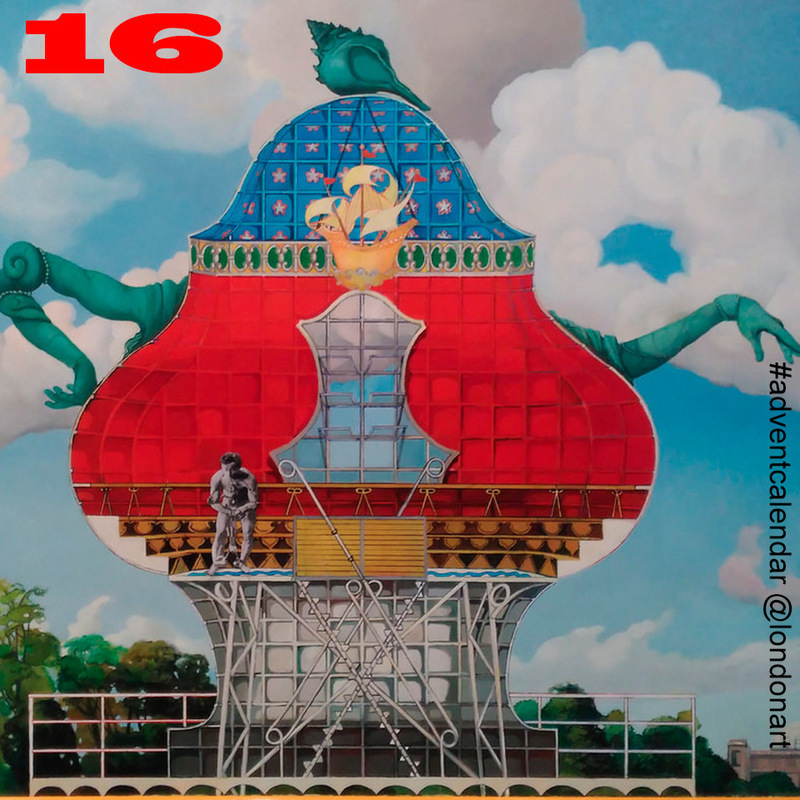 Day 16: The Celestial Teapot by Lukas Duwenhögger, is a proposal for a memorial site for the persecuted homosexuals of National Socialism in Berlin. The work was displayed in his solo show in Raven Row @raven__row earlier this year. Duwenhögger’s figurative paintings conjure his subjects into situations and worlds that are inventively adorned, allusive, anachronistic & compelling. 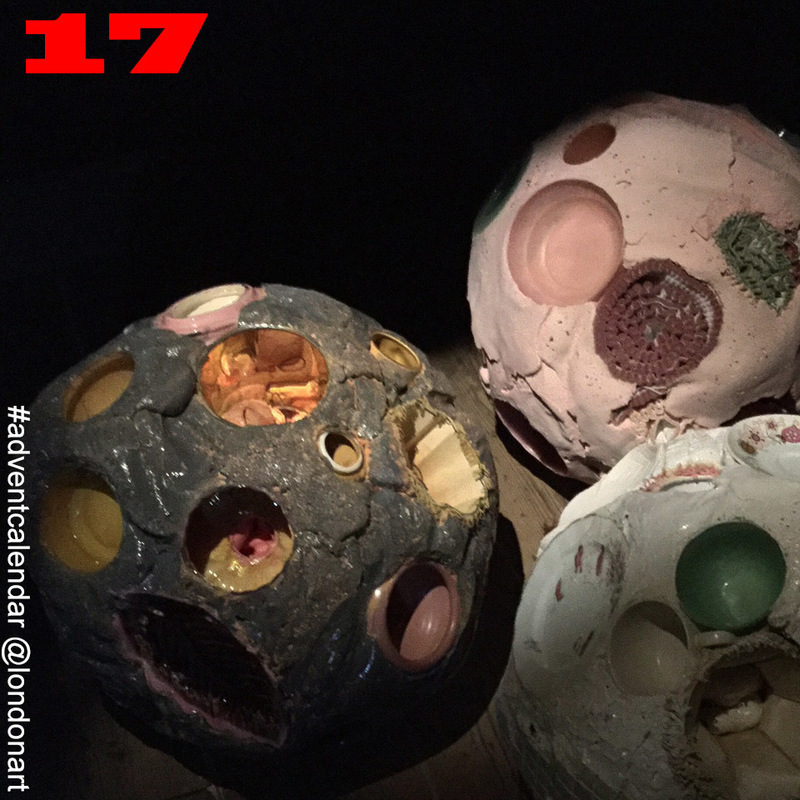 Day 17: Mantle Deposits by Hermoine Allsopp @hermioneallsopp in @arthouse1_ldn 's group show 'It's Offal' - From excrement to innards, 'It’s Offal' looks at the work of artists who have chosen to explore what lies within. A guttural festivity that triggers questions about who & what we really are, our fears & desires, and what we value in the end. See the previous entries in Part 1 here, and those in Part 2 here. 25 visitors upvoted this post.